Garden Projects are a new international series of garden based art projects and shows. Alasdair Duncan, Kyoko Ebata / Tim Byrnes, Catherine Hughes, Steven Morgana, and Matthew Verdon present Gardening. Gardening, Garden Projects #2, will be from Saturday the 31st of August and Sunday the 1st of September, 2013, from 12 to 6, at the garden of 45a Granville Park, Lewisham, London SE13 7DY. Alasdair Duncan makes graphic signs as stand-ins, signifying things that do not exist; emblems of the not-yet imagined; markers for as-yet unclear potentialities. 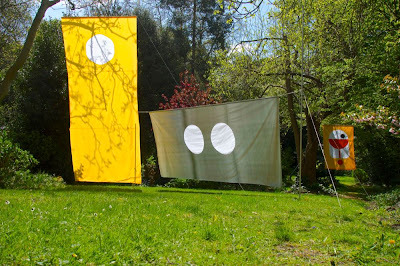 He makes these signs, in a variety of mediums, under the rubric of Signs for the Future, the works for Garden Projects #2 are banners, held from trees. The signs are designed to seem familiar, with a sense of having a meaning, of meaningness, often with a play of potential imagery held from resolution. Prototype V: Three devices of class B Radioactive source. 2013. "Nutopia 2011" is an ongoing collaboration project in Japan between a scientist and an artist, started after the Fukushima incident. Ebata and Byrnes hypothesise a nuclear energy power device in model scale, to power the illumination of a small biotope (a sealed environment in a bottle). The purpose of the experiments is to try gain a relation to how we live in the world, making simple power generators and bottle gardens, sometimes inventing ceremonies in the process, all documented in photography. 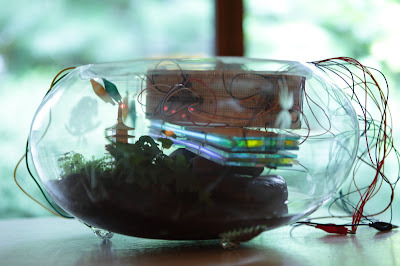 Prototype V, in Garden Projects #2 uses light from tritium, a radioactive isotope, sandwiched between solar panels to create electricity which powers several LED lights. This is done in accordance to "Guidance on the scope of and exemptions from the radioactive substances legislation the UK" September 2011, Version 1.0 (*1), tritium light sticks are categorized as class B which is target of exemption if it is under 1X10(12) bq (non-mobile). 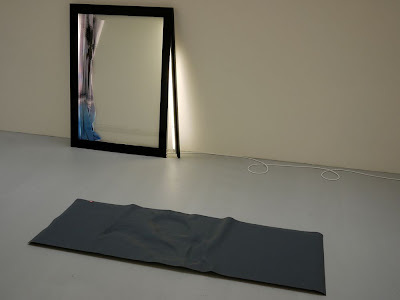 For Garden Projects #2, Catherine Hughes presents a pair of works from 2012: Ardha Matsyendrasana (Half Lord of the Fishes Pose) and Savangasana (shoulder stand). The sculptures are a playful record of imprints from Yoga poses. Catherine Hughes,Artist,b.1977, lives and works in London.SHe graduated from Goldsmiths' MFA Fine Art in 2012. Recent shows include Turf and Surface, Lion and Lamb, London, 2013, and Cash Nexus, Galaria AS,Krakow, Poland, 2012. Catherine has been selected for this year's Bloomberg New Contemporaries which begins at Spike Island, Bristol in September 2013,and will be at the ICA in November 2013. Steven Morgana was born in Perth, Western Australia in 1982 and now lives and works in London, UK. Morgana completed his BFA jointly at Curtin University in Perth and at the École Nationale Supérieure des Beuxs-Arts in Paris (2006-2009) before going on to complete his MFA at Goldsmiths College in London (2010 - 2012). Forthcoming exhibitons include British New Contemporaries (2013, ICA & Spike Island,UK) and Vanguard - Action Field Kodra, parallel program of the 4th Thessaloniki Biennale (2013, Jewish Museum, Thessaloniki, GR). Recent exhibitions inlcude Intensive Care or Such Urgent Times We Live! (2013, News of the World Gallery & Enclave Gallery, London, UK), Tacit Material (2013, RM Gallery, NZ), The Freedman Foundation Travelling Scholarship for Emerging Artists Exhibition (2012, Kudos Gallery, Sydney, AUS), The Future Feels Like a Phantom Limb (2011, La Scatola Gallery, London, UK); Anthology (2011, Charlie Smith london Gallery, London, UK). Change, growth and progress are words that are often stated in political spheres, but do we really understand what these words mean? Change and evolution are unavoidable elements of life, the question is how do we deal with them. Verdon's work utilises natural and vernacular technologies and constructs, these being adapted and transformed with notions of the present to question function, how the 'new' is produced, how we shape systems and structures, and how they shape us. The work in the present exhibition features GM wheat growing from a suspended sandbag, the weight of which is anchored by a reproduction of the bust of the Apollo Belvedere, a classical statue once considered to epitomise the ideal aesthetic of perfection. In addition for Garden Projects #2, Alasdair Duncan, Kyoko Ebata, and Matthew Verdon are producing a collaborative artwork exploring what might be common to their practices, combining elements from each, and the ways that such collaboration might make it's own sense which is not that of any one of the collaborators.